I met Li at my second military training camp -- grueling events all youth were forced to attend at regular intervals throughout the Cultural Revolution. We were eleven years old. I went back to factory work in 1971 at age thirteen, after having spent some time completing mandatory military service. On the book page on Amazon, the Book Description section also boldly claims that "Ping Fu knows what it's like to be a child soldier, a factory worker, and a political prisoner." The term "child soldier" also appeared in a few of her media interviews. At least when she was talking about military training camp, she said it was for "all youth" instead of the factory and countryside jobs that she claimed to be for "bad elements" only. 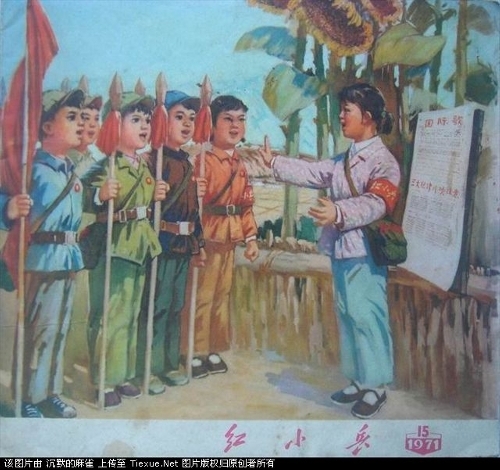 During Cultural Revolution, there were never any mandatory military training camps for kids 11 years old. 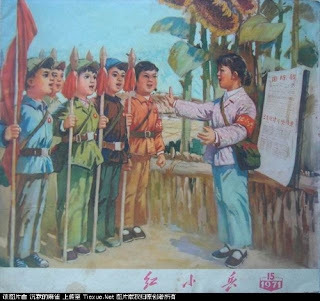 Elementary, middle, and high schools, however, did have military training as part of their regular curriculum, in which pupils used wooden spears decorated with red tassels (红缨枪) and performed marches and drills under the guidance of soldiers and teachers. It could be physically "grueling" at times but was generally a fun activity for the kids. What Fu Ping's story told us is that she was actually in regular school when she was 11 years old. If she was not at school as she has been claiming, there was no way for her to attend such organized activities, especially as a "black element." For the second quote, I tend to think that she or Meimei Fox made a "typo" here and erroneously used the term "military service" instead of "military training camp." Typos, after all, are a mainstay in Fu Ping's defense of her book. There has never been any mandatory military service for China's youth. Quite the contrary, joining the military has long been considered a privilege, especially during the Cultural Revolution years. There was certainly no way a "black element" like Fu Ping could be serving military service, especially at 13 years old! There could be a very small chance for her to enter the military service only if she was very talented in sports or artistic performance.